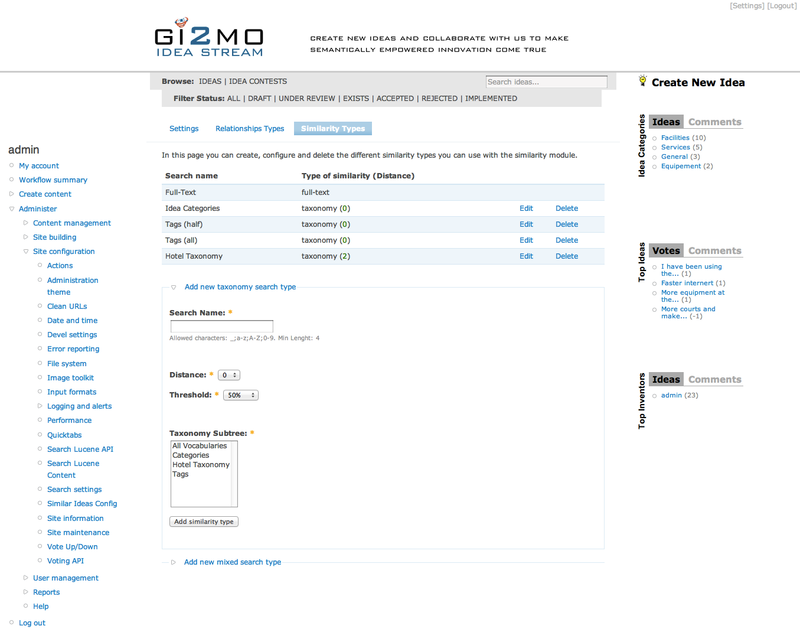 GI2MO Project Homepage » Gi2MO IdeaStream Similarity v3.0 is out! Gi2MO IdeaStream Similarity v3.0 is out! Today we are happy to bring you an update of our similarity module for Gi2MO IdeaStream – an Open-Source Idea Management System based on Drupal. The version bump is quite significant (see last 2.0.2 release) but so are the new features! 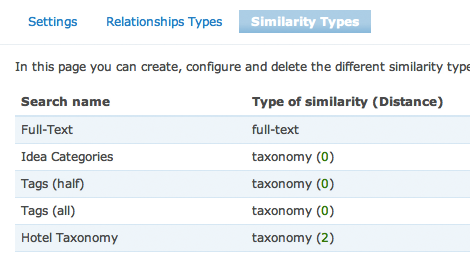 Firstly, we have added similarity types: apart of the full-text search (word frequency), IdeaStream now allows to define similarity measures based on Drupal vocabularies. In other words, you can detect similar ideas based on their tags, idea categories or some custom taxonomies that you create. 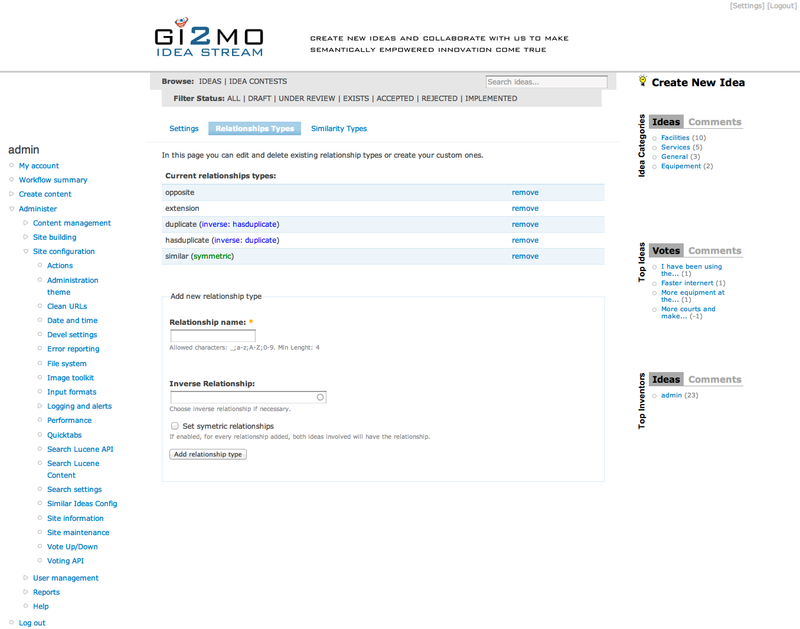 IdeaStream Similarity: search types configuration screen (click to enlarge). In addition, to choosing any Drupal vocabulary for similarity detection the administrator can set the allowed distance between terms in the taxonomy tree, and the threshold of how many terms of similar ideas should match. Furthermore, we allow mixing those search types, so for example you can set similar ideas to be detected only if they have: at least half tags matching, labelled under the same idea category and sort them by keyword frequency. 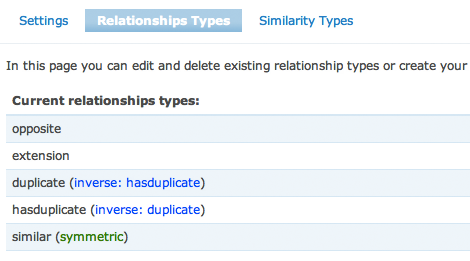 Second major feature, is directions for the relationship types. Now the administrator can mark relationships as inverse or symmetric. In practice, that means that now you can set a relationship that is an opposite of some other (for example “is duplicate of” , “has duplicate”). When similarity reports are submitted IdeaStream automatically takes care of all the logic behind and later allows you to analyse the relationships from any angle you wish. IdeaStream Similarity: symmetric and inverse relationship types (click to enlarge). Apart of those two mentioned features we have extended the number of configuration options, made lots of small enhancements of the user interface, and also applied some bug fixes. You can try it out yourself by downloading the module. For detailed explanations of new features please refer to the change log in the install.txt file as well as module manual in the IdeaStream Similarity dev page. The module has changed quite significantly, so if you are migrating from old versions (e.g. v2.0.2) be sure to run the Drupal update.php script. To make all those new exciting changes more digestible, we have put together a screencast that shows IdeaStream Similarity in action. All the credits for putting together the new version of the module as well as the screencast go to Javier Espinosa Garcia.